BACKGROUND AND PURPOSE: In patients with multiple sclerosis (MS), a few preliminary functional MR (fMR) imaging studies of the visual cortex reveal information about magnitude differences between healthy individuals and patients with MS at only a single luminance level. We therefore investigated whether varying luminance contrast levels can help uncover subtle changes in fMR imaging characteristics of the visual cortex in healthy volunteers and patients with MS.
METHODS: Blood oxygenation level–dependent fMR imaging signal changes in the primary visual cortex were examined as a function of luminance contrast at 1.5 T in 10 healthy volunteers and nine patients with MS. Ten axial sections through the calcarine fissure were obtained with an echo-planar T2*-weighted imaging sequence (4000/54/1 [TR/TE/excitation]; field of view, 220 mm; voxel size, 1.72 × 1.72 × 5 mm). The imaging series consisted of an alternating 20-second rest epoch (black screen) with a 20-second activation epoch (flickering checkerboard) repeated six times. Each imaging series used a graded increase of eight luminance contrast levels. A paired t test between rest and activation images was used to analyze significant (P < .001) contiguous voxels in the region of interest (primary visual cortex). RESULTS: A progressive increase in fMR imaging activation across all luminance contrast levels in healthy controls and patients with MS was shown. The patients with MS had a significantly lower magnitude in the number of fMR imaging activated voxels at all luminance contrast levels (P < .001). A statistically significant increase in fMR imaging activation (activation threshold) was seen at the second luminance contrast level in controls and at the seventh level in patients with MS. CONCLUSION: Quantifiable changes in blood oxygenation level-dependent signal and a progressive increase in activated voxels within the primary visual cortex with increasing luminance contrast were demonstrated at 1.5 T in controls. The patients with MS showed a significant decrease in the number of activated voxels and an increase in activation threshold compared with healthy controls. Functional MR (fMR) imaging is an advanced technique that has the potential to greatly enhance our understanding of the consequences of demyelinating diseases on cortical activation and processing. Multiple sclerosis (MS) is a demyelinating disorder that produces clinical dysfunction by altering conduction through various fiber pathways in the central nervous system. The effects of demyelination in MS are monitored by symptom reporting (1, 2), neurologic examination (1, 2), neuroimaging (3–5), and electrophysiologic studies (1–3) (eg, visual evoked responses) (6–8). MR imaging is currently a confirmatory test in the evaluation of patients with MS. However, the correlation between the number or volume of lesions seen on MR images and measures of patient functional disability is weak (5, 9). It has been shown that the clinical severity of the MS lesions measured by using a clinical disability score (Expanded Disability Status Scale) does not always correlate with the volume measurement of MS lesions when using MR imaging (10). This might be because the lesions occur in noneloquent regions of the brain as well as in eloquent regions containing MS plaques that produce only partial demyelination. Physiologic methods for assessing changes due to neuronal disconnection or the functional consequences of demyelinating lesions in MS as they relate to cerebral function are lacking (11, 12). Current imaging studies help determine only the anatomic location of demyelinating lesions and do not allow evaluation of the extent of axonal conduction loss in regions of white matter demyelination. Functional MR imaging of the brain by use of echo-planar imaging provides images of brain activity during a task (eg, motor, visual, cognitive). The blood oxygenation level-dependent (BOLD) (13) contrast mechanism is the basis of the fMR imaging used in this study. An increase in partial pressure of oxygen in blood causes an increase in hemoglobin oxygen saturation, which decreases the concentration of paramagnetic deoxyhemoglobin. This decrease causes a reduction in the tissue-blood susceptibility differential, which, in turn, decreases spin dephasing and results in an increased T2* signal. This BOLD effect has been used primarily in functional brain mapping studies, where a local increase in the signal due to cerebral tissue activation may be caused by an increase in the blood oxygen partial pressure. This technique has been used in several areas of brain research and has shown promising results for studies of photic stimulation of the visual cortex (14–21). There have been few fMR imaging studies of the visual cortex in patients with MS and those without optic neuritis (22–24). All of these preliminary studies reveal information about the magnitude differences between healthy individuals and patients at only a single luminance level. In our investigation, we used a unique methodology of graded luminance contrast as the stimulus for the primary visual cortex. The visual pathway has been selected in this study as it is known to be affected in patients with MS either because of optic neuritis or MS plaques involving the more proximal portions of the visual pathway (25). If fMR imaging can be shown to show changes in the visual cortex in patients with known deafferentation, then this method can be further applied to brain abnormalities for which tests of quantitative functional assessment are currently inadequate. Therefore, the purpose of our study was to investigate whether varying luminance contrast levels can uncover subtle changes in the fMR imaging characteristics of the visual cortex in healthy volunteers and patients with MS. Ten healthy volunteers (mean age, 26.1 years; SD, 3.9) and nine patients with MS and a history of optic neuritis (mean age, 41.1 years; SD, 5.7) were studied. All the volunteers were screened for medical illness. Informed consent as approved by the institutional review board was obtained from all the participants prior to study. MS was diagnosed per the criteria of Poser et al (2), and all patients had a history of optic neuritis (Table). Visual evoked potential (VEP) studies were performed for all the healthy volunteers as well as for five patients to assess the visual pathway. The remaining four patients with MS chose not to participate in the VEP study. The VEP studies were performed within a week of MR imaging. The visual acuity of all the subjects was measured by using a Snellen chart. All MR imaging was performed with a 1.5-T imager with echo-planar capability (Vision Imager; Siemens, Erlangen, Germany). A standard quadrature head coil was used. Foam pads were placed within the head coil to prevent head motion. All the subjects were instructed to lie still throughout the imaging procedure and to look into the center of the field of view of the MR-compatible goggle system (MR Vision 2000; Resonance Technologies, Northridge, CA). A precise localization of the occipital cortex was performed by using standard anatomic markers to define the angle of the axial section for all subjects (anterior commissure and posterior commissure [AC-PC line]). The AC-PC markers were identified from a sagittal scout image. Ten contiguous oblique axial images were positioned and aligned parallel to the AC-PC line. The most inferior section was placed at the inferior margin of the occipital lobe. Ten sections were chosen to cover the entire occipital cortex. After the positioning of these 10 sections, two MR pulse sequences were performed separately to obtain anatomic and functional images. An axial T1-weighted spin-echo imaging sequence was performed to acquire anatomic images. The imaging parameters were as follows: 600/15/1 (TR/TE/excitation); matrix size, 256 × 256; field of view, 22 cm; section thickness, 5 mm. Functional images were acquired with a gradient-echo, echo-planar free induction decay (EPI-FID), T2*-weighted pulse sequence in the same plane as that in the structural images, and the parameters were as follows: 4000/54(minimum)/1; matrix size, 128 × 128; field of view, 22 cm; section thickness, 5 mm. The fMR imaging of the visual cortex was performed with a 5 × 5 flashing (flicker rate, 8 Hz) checkerboard activation paradigm at eight luminance contrast levels: 1.0 (lowest achievable), 2.5, 4.0, 5.5, 7.5, 11.0, 14.5, and 18.0 (highest achievable). The corresponding absolute luminance contrast levels in candela (cd)/m2 (0.02, 0.05, 0.08, 0.11, 0.15, 0.22, 0.29, and 0.36) were measured through the goggle system by using a digital luminance meter (Mavo-Monitor; Gossen, Nurnberg, Germany). The changes in the luminance contrast levels were obtained by changing the gray scale levels of the white checkerboard regions presented on the screen. Each individual experiment at a specific luminance contrast level was defined as a “run.” Each run consisted of six rest and six activation epochs that followed a blocked design (ABABABABABAB). The rest epoch began with a black screen being displayed, whereas during the activation epoch a checkerboard stimulus was displayed. During each epoch, 10 contiguous axial sections through the calcarine fissure region were obtained. This process was repeated five times, yielding 50 images per epoch. The imaging time for each epoch was 20 seconds. The total acquisition time to complete all eight luminance contrast levels was 32 minutes. The visual stimulus was presented (visual angle, 12°) through the goggle system with use of Neuroscan software (Sterling, VA) programmed on a Pentium 200 MHz computer. The goggles were adjusted to achieve normal visual acuity in the healthy volunteers and patients. Two criteria dictated the choice of tasks to serve as stimulation with fMR imaging. First, the task had to maximize the probability of distinguishing between the experimental groups. Such a task would have to be a robust and focal activator of the primary visual cortex. Second, the task had to be flexible enough to provide well-controlled, graded input to the visual system. This alone would allow testing of the hypothesized linear relationship between the severity of visual pathway dysfunction and a lowered fMR imaging activation level in MS.
Several visual “activators” were candidates. Visual forms or objects have the disadvantage of being represented either by quite small regions of activation (V1 region, line detection), which might not be inactivated by all optic pathway lesions, or, in the case of objects, by quite large regions involving multiple brain areas including the association cortex (Brodmann’s area 18 or 19) (26). The presence of multiple regions of activation would make linkage of patients with MS to specific visual cortex abnormalities less direct and clear. Motion stimulus is a focal activator of the V5 region of striate cortex. However, this stimulus is difficult to present in a controlled, graded fashion. Color stimulus was a potential activator but has the disadvantage of multiple visual components (hue, saturation, and luminance), as well as introducing the possibility that subtle achromatopsia could affect performance. In favor of the use of the luminance contrast as our stimulus, Shapley (27) has shown, using single cell recordings, that cells within the magnocellular layers of the macaque monkey’s lateral geniculate nucleus strongly increase their activity in response to changes in luminance contrast. From these animal studies and other human studies, luminance contrast stimuli appeared to be the best choice as a visual paradigm to probe the response of the primary visual areas (15, 18). Stimuli that vary in luminance contrast on the white-gray-black scale can be constructed and measured through a luminance meter. Also, luminance contrast is a robust primary cortex activator, neither too narrow nor too broad in its reach of activation. Finally, luminance contrast is a core, separable component of visual stimuli (ie, is not multideterminate), making the link between stimulus and activation clear and direct. All of these factors contributed to our choosing luminance contrast as the visual stimulus in this study. The postprocessing was done with a Unix-based software package (Medx, Version 2.1; Sensor Systems Inc, Sterling, VA) installed on an Indigo2 workstation (Silicon Graphics, Mountain View, CA). A three-dimensional automated image registration program was used to align all the images (28). To ensure a consistent physiologic state and to eliminate rise and fall artifacts in the BOLD signal, the initial 20% of the data of each rest and activation epoch was dropped from the analyses. Finally, the variance in the functional data related to the time course of the experiment was eliminated through a linear detrending procedure, using a covariance analysis. The region of interest (ROI) was defined on T1-weighted images on the basis of neuroanatomic landmarks of the occipital lobe (eg, vertical axis centered on calcarine sulcus) covering the full extent of the striate cortex, including regions V1, V2, and V3. A rectangular area of approximately 4.0 × 3.0 cm (transverse and anteroposterior dimensions, respectively) was chosen and placed over the region of the medial occipital cortex. This rectangular ROI was drawn by hand by a board-certified neuroradiologist (S.H.F.) to cover the entire primary visual cortex. In both the healthy volunteers and the patients, the striate cortex was present on three contiguous images. Normalized t scores (z scores) were used to determine significantly activated voxels. This ROI was applied to the z-score images. It is important to note that all statistical analyses were limited to voxels in this ROI. A threshold (P < .001, reflecting a z score of 3.28) was established so that only the highly significant voxels that remained within the ROI and lay on gyri were used for analysis. The number of activated voxels within the ROI was calculated for all the volunteers and patients from these parametric z-score images. In one of the healthy subjects, the fMR imaging experiment across all luminance contrast levels was performed twice for reproducibility. The volunteer was positioned in the same location inside the imager (ie, the center of the head coil identified by markers in the coil). Ten contiguous axial images were acquired to cover the entire occipital cortex. A precise localization of the occipital cortex by using standard anatomic markers (AC-PC line) was applied (29). The experiment was then repeated. The time difference between the two experiments was 2 hours. The number of activated voxels as well as the z scores of the activated voxels were measured during both experiments. A t test was performed to compare the number of activation voxels between the two experimental trials. On the basis of the data from highly significant voxels, the number of activation voxels within the ROI at all eight luminance contrast levels was measured. An analysis of variance (ANOVA) procedure using SPSS-PC (SPSS Inc, Chicago, IL) was performed. The fMR imaging activation patterns of the healthy volunteers and the patients with MS were compared. The results of the ANOVA determined the differences between these two populations in their number of activated voxels and their activation threshold levels. Activation threshold is defined as the first significant increase (P < .05) in number of activated voxels in the primary visual cortex compared with the lowest luminance contrast level (level 1). All the healthy controls were required to wear corrective lenses if needed, and the corrected visual acuity as measured with the Snellen’s chart was 20/20. The results of the VEP showed normal P100 levels in all 10 volunteers. There was no statistically significant difference between the activated voxels at any luminance contrast level between male and female volunteers. Figure 1 shows the mean number of activated voxels in the visual cortex. The plot shows an increase in the number of activated voxels with increase in the luminance contrast in all the healthy controls, as well as in patients with MS. Within-subject ANOVA statistics between the different luminance contrast levels in the controls show a significant difference between the initial two luminance contrast levels of 1 and 2.5 (P < .05). 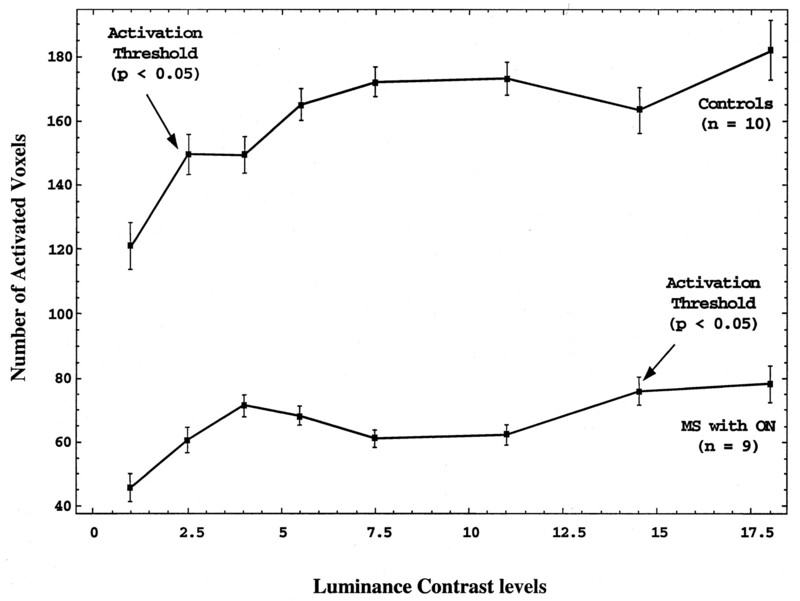 This demonstrates that in the healthy volunteers an early activation thresholding effect existed between the baseline luminance contrast level (lowest luminance contrast level achievable by our system) and the luminance level of 2.5. Line graph shows the number of activated voxels with graded increase in luminance contrast in healthy volunteers (controls) and patients with MS and a history of optic neuritis (MS with ON). Figure 2 depicts a composite, single-section, axial T1-weighted image and fMR imaging activation map at the level of the primary visual cortex in a healthy volunteer, at three luminance contrast levels: lowest (baseline); intermediate; highest. Activation in the ROI is shown in red and yellow. Areas of activation in the extrastriate visual pathways, lateral to the primary visual cortex, were also noted. The voxels present in the extrastriate cortex were not included for analyses. Both colors represent significant z scores (z = 3.24), with yellow corresponding to the relatively more significantly activated voxels. A progressive increase in the number of activated voxels (fMR imaging activation) with increasing luminance contrast levels was noted. Composite, axial T1-weighted image and fMR imaging activation map at the level of the primary visual cortex in a healthy volunteer at three luminance contrast levels: (A) lowest (baseline), (B) intermediate, (C) highest. Activation in the ROI, which represents the primary visual cortex within the medial portion of the occipital lobes (arrow, C), is shown in red and yellow, with yellow corresponding to the relatively more significantly activated voxels. The reproducibility test in a healthy volunteer showed no significant differences in the number of activated voxels at each luminance contrast level between the two experiments (P > .05). Comparison of the z scores of the activated voxels within the ROI at each individual luminance contrast level also showed no statistical difference between the two data sets (P > .05). Analysis of the mean activation voxels between the two experiments (experiment 1: mean, 157.2 ± 29.3 [SD]; experiment 2: mean, 137 ± 22.1) showed no statistical difference between the two data sets (P > .05). This is a preliminary finding, and further study with a larger population is warranted. All patients were required to wear corrective lenses if needed, and the corrected visual acuity as measured by the Snellen’s chart was 20/20. The VEP was performed in five of the nine patients, and the results showed abnormal delayed P100 levels in all the patients with MS. Figure 1 shows the mean number of activated voxels in the primary visual cortex. Within-subject ANOVA statistics between the different luminance contrast levels in patients with MS show a significant difference between the two luminance contrast levels of 1 (baseline) and 14.5 (P < .01). This shows that there is an increased activation threshold effect in the patients with MS between the luminance contrast levels of 1 and 14.5. Figure 3 shows a composite, single-section, axial T1-weighted image and fMR imaging activation map at the level of the primary visual cortex in patients with MS, at three luminance contrast levels: 3A, lowest (baseline); 3B, intermediate; 3C, highest. Activation in the primary visual cortex within the chosen ROI is shown in red and yellow. Both colors represent significant z scores (z = 3.24), with yellow corresponding to the relatively more significantly activated voxels. At the lowest luminance contrast level (Fig 3A), there was low-level fMR imaging activation. No significant change in fMR imaging activation was seen in the intermediate level (Fig 3B). However, at the highest luminance contrast level (Fig 3C) there was prominent fMR imaging activation. Composite, axial T1-weighted image and fMR imaging activation map at the level of the primary visual cortex in a patient with MS at three luminance contrast levels: (A) lowest (baseline), (B) intermediate, (C) highest. Activation in the primary visual cortex is shown in red and yellow. There is low-level fMR imaging activation in A, no significant change in activation in B, and prominent activation in C.
Figure 1 shows the mean number of activated voxels in the primary visual cortex in the MS population compared with that in healthy controls. The patients with MS showed a significantly lower number of MR imaging activated voxels at all luminance contrast levels (P < .001; F = 30.77). This might represent a combination of decreased number of neurons or decreased activation in the diseased axons along the optic pathway. On the fMR imaging activation curve, the slopes between baseline and the second graded luminance contrast level (14.5) in controls and between baseline and the seventh graded luminance contrast level (2.5) in patients with MS were different. The mean slope in the healthy population was 19.0 versus 6.0 in the patients. Similar to activation threshold, these differences in slope might represent a sensitivity measure of visual cortical activation at different luminance contrast levels between these two groups. These BOLD signal characteristics disclosed by using luminance contrast demonstrate a different pattern of fMR imaging activation in MS.
Current routine MR imaging studies determine the anatomic location of a demyelinating lesion, yet there are few methods for evaluating the functional consequences of axonal conduction loss due to demyelination. Moreover, there are no definitive methods for relating neuronal disconnection, as occurs in MS, to cerebral functions (ie, the performance of physical or cognitive tasks or progression of disability). Functional MR imaging is a state-of-the-art technique currently used to study brain function that has the potential to quantify the effects of demyelination on cortical activation and processing in MS. The optic pathway represents a good anatomic target for building an fMR imaging–based model of MS disease activity, because it is a pathway frequently involved in cases of MS. This methodology has been widely used and has shown promising results for fMR imaging studies of photic stimulation of the visual cortex (15). The effect of luminance contrast on the fMR imaging signal response when using high-field-strength magnets (4 T) has been recently demonstrated in healthy individuals (20). Further, experiments using BOLD fMR imaging have shown visual stimuli such as contrast-reversing gratings or checkerboard patterns more strongly activate the primary visual cortex compared with stimuli involving diffuse illumination (20). On the basis of these observations, we chose luminance contrast created by a flickering checkerboard as our stimulus and found it to be a robust activator of the primary visual cortex. There are few fMR imaging studies of the visual cortex in patients with MS. In a recent study, Rombouts et al (30) used 1.5 T to assess the visual cortex response to monocular stimulation in patients with optic neuritis. Their results revealed a smaller area of activation in the visual cortex when the affected eye was stimulated compared with the normal eye. Three studies have confirmed smaller areas of activation in the visual cortices of patients with optic neuritis (22, 23, 31). All of these preliminary studies used a single stimulus for the functional experiments. These experiments only reveal information about the differences between healthy individuals and patients at high luminance levels. Our results suggest that modulations in visual stimulation within a graded stimulus characteristic, such as luminance contrast, can result in quantifiable changes in fMR imaging BOLD signal and can show different patterns of activation in patients with MS compared with those in healthy volunteers. Our results demonstrated an overall progressive increase in activated voxels with increased luminance contrast in controls and patients with MS. The patients showed a significantly lower number of fMR imaging-activated voxels at all luminance contrast levels. The patients showed a statistically significant increase in fMR imaging activation at the seventh graded luminance contrast level (activation threshold) compared with that of the second graded level in controls. This might represent a combination of decreased number of neurons and decreased activation in the diseased axons along the optic pathway. All of these characteristics might represent unique fMR imaging patterns and correlate to changes in cortical activation and processing in response to white matter demyelination. In our investigation, we used a unique methodology of graded luminance contrast as the stimulus to the primary visual cortex. We confirmed that there is a decreased activation of the primary visual cortex in patients with MS. Moreover, varying the luminance contrast gave us certainty that this effect is not limited to a specific luminance contrast level and occurs with submaximal as well as maximal stimulation of the visual cortex. Additionally, our fMR imaging paradigm revealed a pattern of fMR imaging activation that was more complex than a simple reduction in the imaging response. The pattern of fMR imaging activation in patients with MS varied from that of healthy volunteers in both the slope of the fMR imaging activation curve as well as in the activation threshold. These two related characteristics, decreased slope and delayed activation threshold, shown in the group with MS imply decreased sensitivity in cortical activation to visual stimulus as compared with healthy controls. Patients with MS typically recover relatively normal vision after optic neuritis, but our understanding of just how this occurs is poor. There are three plausible, albeit theoretical, ways in which cortical activation might be involved in the recovery of relatively normal vision. First, the optic nerve might remyelinate sufficiently to reestablish normal inputs to the lateral geniculate and primary visual cortex, in which case the sensitivity of cortical activation would remain normal. The sensitivity of cortical activation would also remain normal if compensation for impaired optic nerve inputs occurred solely at the level of the lateral geniculate. Although we could detect activation within the lateral geniculate bodies in a few healthy volunteers, we were unable to investigate the relationship between the lateral geniculate and cortical activation because only one or two voxels of BOLD signal could be discerned within the anatomic boundaries of the lateral geniculate at 1.5 T. Chen and Zhu (32) suggest that this obstacle could be overcome by employing a stronger magnetic field. Second, the once-injured optic nerve might continue to provide compromised stimulation of the primary visual cortex, but the cortex itself would increase its sensitivity so as to compensate for the diminished inputs originating from the optic nerve. Denervation supersensitivity of this sort has been demonstrated in the brain along with concomitant alterations in regional metabolism. For example, positron emission tomography (PET) studies have revealed increased metabolism in the basal ganglia occurring in association with denervation supersensitivity at the dopamine-receptor level (33). Third, the optic nerve might continue to provide decreased inputs to the primary visual cortex, which in turn would evidence proportionately diminished activation, the relatively normal vision being restored by way of compensatory increases in the sensitivity of cortical regions associated with visual processing outside the primary visual cortex. Increased metabolism in extrastriate cortical areas in response to visual stimulation has been demonstrated by PET in a patient with a developmental anomaly of the visual cortex (34). Such a compensation by extrastriate cortex, however, is not a foregone conclusion in visual impairment; this is evidenced by Imamura et al’s (35) PET findings of decreased regional blood flow in Brodmann’s areas 18 and 19 with visual stimulation of the amblyopic eye in subjects with strabismic amblyopia. We have demonstrated that the primary visual cortex likely has decreased sensitivity, as manifested by a decrease in slope and delayed activation threshold of the fMR imaging visual response curve, making the first two theoretical mechanisms of compensation after optic neuritis highly improbable. Werring et al (36) recently showed an increase in cortical activation of extrastriate regions in response to visual stimulation by using fMR imaging in patients with MS who recovered from optic neuritis. Our study complements the work of Werring and colleagues and adds to a better understanding of the consequences of demyelination along the optic pathway in MS. The complexity of the activation curve generated by varying luminance contrast levels implies that the relationship between loss of optic nerve inputs and activation of the primary visual cortex may not be a simple one-to-one association. Patients with MS might have demyelinating plaques at multiple foci within the optic pathways and visual processing areas. Some of these plaques might be too small to be detected on conventional MR images, and even normal-appearing white matter might be altered in the brains of patients with MS as shown with magnetization transfer imaging (37) and MR spectroscopy (38). In addition, there is a new appreciation for the degree of axonal and neuronal injury occurring throughout the brains of patients with MS (39). Our findings suggest that fMR imaging might provide a measure, not only of the functional consequences of impaired optic nerve conduction but also of impaired cortical processing. It is probable that MS lesions remote from the optic pathways could affect processing within the primary visual cortex. That inputs other than those originating from the optic nerve impinge on the primary visual cortex has been demonstrated in PET studies showing increased metabolism in the primary visual cortex of blind subjects reading Braille (40). Studies are currently underway in our laboratory to distinguish the cortical consequences of optic neuritis from the consequence of more widespread demyelination. Our findings are preliminary and extremely encouraging in showing the potential clinical utility of fMR imaging in measuring cerebral dysfunction due to demyelinating brain disease, a field that we believe warrants further investigation. The application of fMR imaging technology to MS might ultimately prove invaluable in defining subtypes of disease, in monitoring the progression of disease, and in assessing the response to both current and experimental drug therapies. Supported in part by grant PPO666 from the National Multiple Sclerosis Society. Presented in part at the annual meeting of the American Society of Neuroradiology, Atlanta, April 2000. Accepted after revision July 30, 2001.